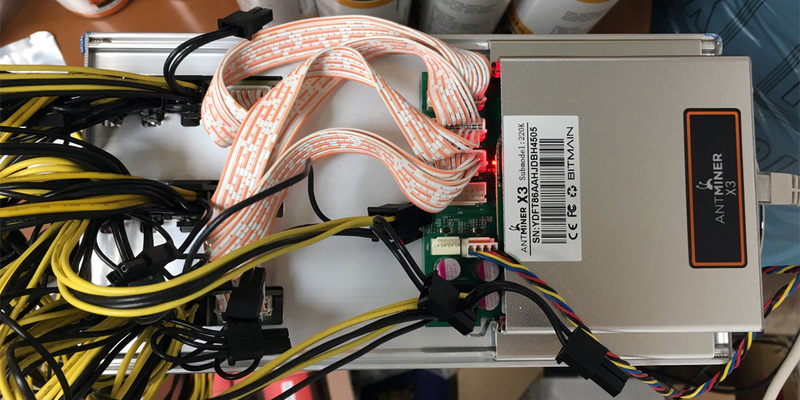 We got our hands on a Bitmain Antminer X3 CryptoNight ASIC miner for a few days and have decided to give this soon-to-be or already way too expensive paperweight a quick test to see what you can expect from the device as they have been shipping for a week or two already to customers. The Antminer X3 is capable of delivering 220 KHS at 550W of power usage as per specifications and the device kind of manages to actually deliver on these numbers. The kind of part is because we’ve experienced some weird results trying to actually make the ASIC miner work properly on some popular pools and services such as NiceHash for example. When you point out the X3 to NiceHash’s CryptoNight (not CryptonightV7) stratum you get the device to connect and report extranonce support, but all you get are rejects and 0 as hashrate. So apparently the Antminer X3 does not work properly on NiceHash at the moment, even after flashing the latest available firmware that seemed a day newer than the one on the device we have tested. No go on NiceHash which seems as the best option for the moment considering that there are not that many CryptoNight coins left that offer good profit as most of the serious coins have already switched to the new ASIC-proof (for now at least) CryptoNight V7 algorithm. 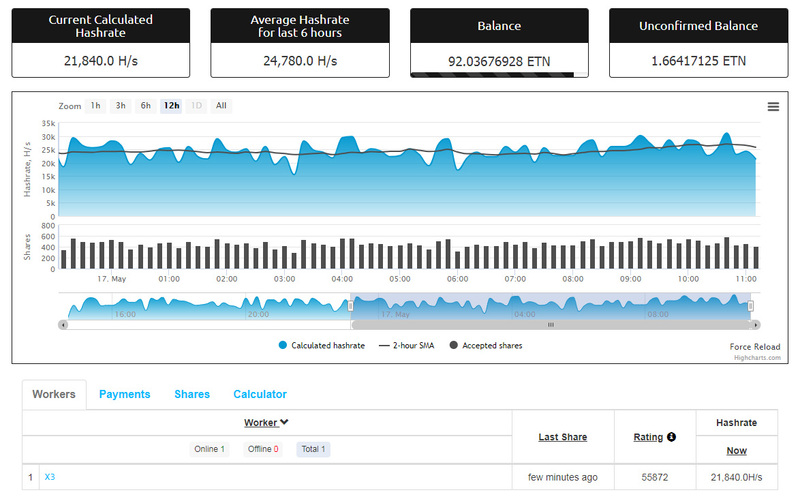 Moving to a quick test on Nanopool’s Electroneum (ETN) mining pool as the next best thing after NiceHash in terms of profitability kind of worked, but not as we have expected. Here the miner connects and apparently works on the pool side, but the pool reports only about 20 KHS hashrate and not the full 220 KHS that it should. 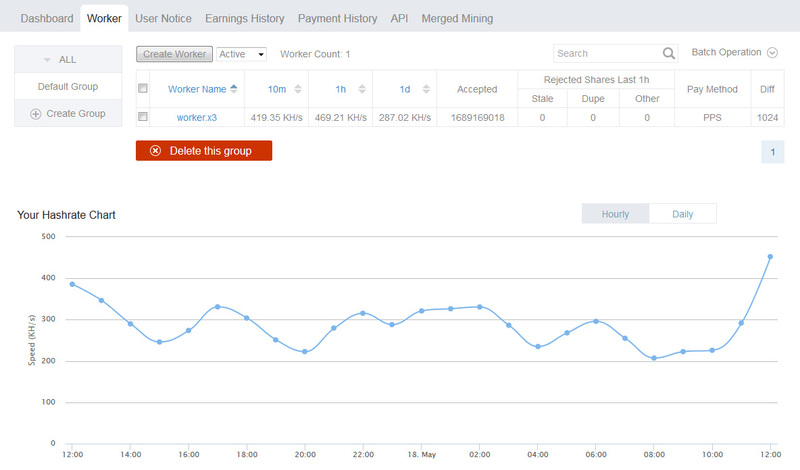 Locally the miner seems to work fine and the locally reported hashrate is also fine with a bit over 235 KHS average reported. 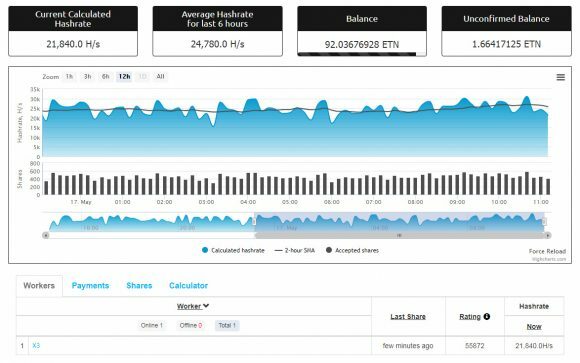 People have reported success on some smaller ETN pools with the X3 ASIC miner, but even if you manage to make the device work properly on Electroneum you will not have a lot of time before ETH also forks and becomes unmineable with this miner. The next thing to try was going for AntPool and Monero Classic (XMC) where with no surprise thins worked great out of the box, after all this is Bitmain’s mining pool, where they probably also test all the miners before shipping them to customers, so no surprise that it all works. The problem however is that you only get to mine XMC there and it is traded on only two exchanges according to CoinMarketCap, but at least it works and you can probably make a coin and a half to about two XMC coins per day at the moment or roughly maybe about $15-18 USD at the current rates and difficulty. Here is how the situation looks profitability wise for the Antminer X3 ASIC miner on CryptoNight according to WhatToMine. The other possibly interesting coin to try mining with AntMiner X3 is ByteCoin (BCN) that has recently seen some boost in interest probably tied to the availability of the X3 ASIC miners in the hands of miners. So do you think that the BitMain AntMiner X3 is a soon-to-be or is already way too expensive paperweight? We definitely do not like the fact that it is not working properly on services like NiceHash or big pools like Nanopool out of the box, Bitmain should’ve had enough time to make sure possible issues have been resolved… and they can always release an update to fix problems like these while the devices are traveling to their customers. Can’t say we are happy for the short time we had with the X3 miner to give it a try and would definitely not recommend it at the moment, not that we did when they were announced either. 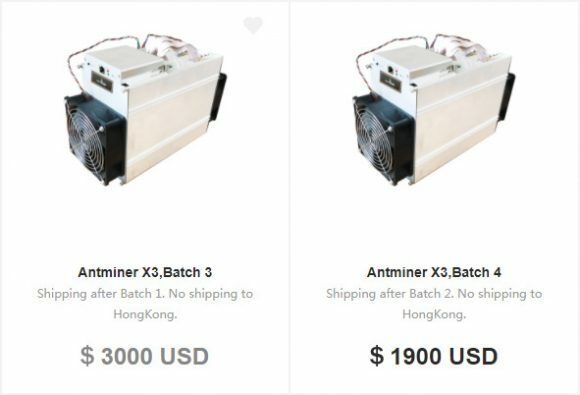 It seems that some people think that Bitmain has lowered the prices of their upcoming Antminer X3 Cryptonight ASIC miners, however that is not true, the company has just released new Batches 3 and 4 for pre-order and has removed the first two super expensive ones. 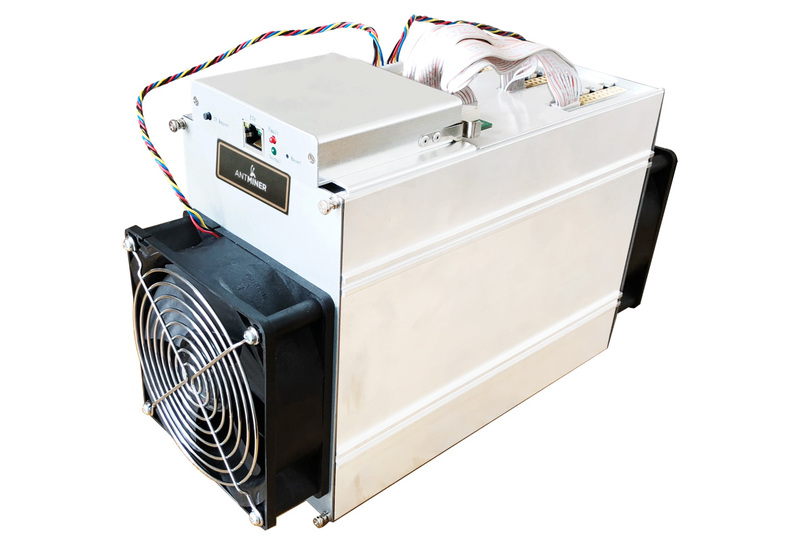 Batch 1 of the Antminer X3 had a price of $11999 USD and should start shipping by the end of May and Batch 2 had a price of $7599 USD by the end of June. The prices of the first two batches are very important as well as their shipping dates are tied to the two new batches, so for example the new Antminer X3 Batch 3 with a price of just $3000 USD should start shipping after Batch 1 and the new Antminer X3 Batch 4 with a price of just $1900 USD should start shipping after Batch 2. What Bitmain already did was screw over anyone that has ordered their Batch 2 devices as the new Batch 3 of the Antminer X3 Cryptonight ASIC should ship faster and at less than half the price. Actually the same goes for pretty much anyone that has ordered or plans to order any of the batches of the Antminer X3 Cryptonight ASIC miners from Bitmain, so consider wisely if you still have not purchased any, but are considering it. As we have already mentioned Monero (XMR) and a number of other CryptoNight coins are planning to fork to a new CryptoNightV7 POW that should make any of the current CryptoNight ASIC miners unusable, so a pretty risky thing to pre-order ASIC mining hardware at the moment and wait for it for a few months. If you thought that recently announced Baikal Giant-N Cryptonight ASIC miner is powerful and is going to kill the Cryptonight GPU mining you might want to reconsider. Bitmain has just announced their response in the form of the Antminer X3 Cryptonight ASIC miner and it is much more powerful than what Baikal Miner is offering. The Bitmain Antminer X3 promises 220 KH/s hashrate for Cryptonight at 550 Watts of power usage, so 11 times more powerful than the Giant-N at roughly 2 times higher price and shipping the second part of May. By the time these devices start shipping Monero (XMR) will most likely not be mineable anymore with Cryptonight ASIC miners along with some other coins that have announced plans to fork in order to remain ASIC resistant, so all the extra hashpower will need to go somewhere else. At a price of $11999 USD per device and limited to just 1 unit per order Bitmain is accepting only BCH and USD payments for the miners. The second batch of Antminer X3 is planned to start shipping a month later, so in the second part of June with a significantly lower price of $7599 USD, though who knows how many Cryptonight coins might fork to ASIC resistant implementation by then. Just to be on the safe side be careful with the Cryptonight ASICs from Baikal and form Bitmain in order not to end up with a piece of useless hardware that can hardly mine anything profitable, even with its very high performance. – For more information about the upcoming Bitmain Antminer X3 Cryptonight ASIC miner….